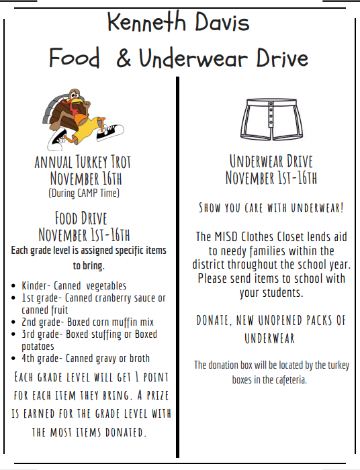 Each grade level is assigned specific items to bring for the food drive. Each grade level will get 1 point for each item they bring. A prize is earned for the grade level with the most items donated. Show you care with underwear! The MISD Clothes Closet lends aid to needy families within the district throughout the school year. Please send items to school with your students. DONATE, NEW UNOPENED PACKS OF UNDERWEAR! The turkey donation boxes are located in the cafeteria! Let's fill those boxes! Click here for printable flyer.